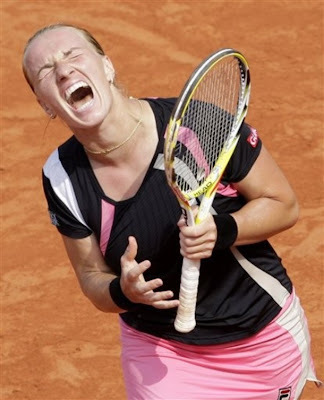 Safina overpowered Cibulkova after her usual slow start and Kuznetsova weathered the Stosur storm and now we get the final we expected at that start now that the usual distractions of Williams’ sisters and talented but underachieving Serbs have been eliminated. The blazing battle to see who gets to lose to Fed. Gonzalez in three. Del Potro’s already conceded this it seems, which is nice of him but takes a little of the suspense from the game. Of course he could be messing with Fed’s head but no doubt we’ll all tune in to see if Roger’s ready to ascend to the vacant title and if Del Potro has any surprises to offer. Federer in four. There’s more doubles on somewhere too if anyone cares. Kim Clijsters puts some nice pressure on herself to instantly perform by bagging the current players who all play the same type of tennis.